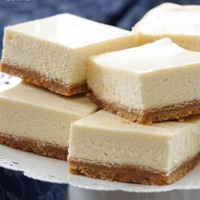 This is a creamy cheesecake with a graham cracker crust. What can I say it's straight up cheesecake . This recipe is the property of MattyWill and released under the CC Attribution-NonCommercial-NoDerivatives 4.0 license. You may not copy, derive or commercialize this recipe without following the terms of this license or the explicit permission of the creator.